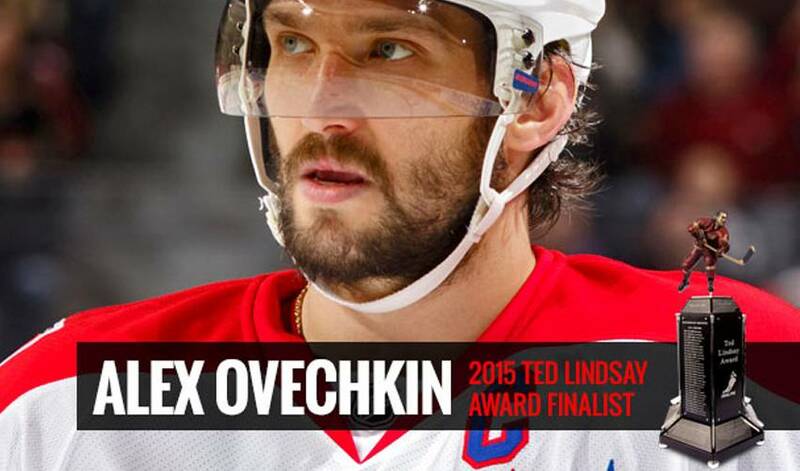 Will Alex Ovechkin go forth and win his fourth Ted Lindsay Award? His teammates are certainly in his corner. Alex Ovechkin, of Moscow, Russia, played 81 games for the Washington Capitals during the 2014-15 regular season, and helped lead the Capitals back into the playoffs in the Eastern Conference. Ovechkin scored 53 goals to capture his fifth Maurice “Rocket” Richard Trophy (2007-08, 2008-09, 2012-13, 2013-14), and he became the sixth NHL player to record six career 50-goal seasons. He led the league in power-play goals (25) and game-winning goals (11), and he finished fourth in points (81) and eighth in points-per-game (1.00), which also earned him his fifth finalist nomination for the Hart Memorial Trophy – an award he has won three times (2007-08, 2008-09, 2012-13). Ovechkin is vying for his fourth “Most Outstanding Player” award. He previously received the players’ Award in three consecutive seasons (2007-08, 2008-09, 2009-10), and he was also a finalist in both 2005-06 and 2012-13. With a trio of Ted Lindsay trophies already bearing his name, one of hockey’s most dynamic players and personalities once again finds himself in a familiar position. For those who see him perform day in and day out, it’s a deserving recognition of his abilities. Ovechkin also seems to have the uncanny knack for making hockey enjoyable throughout the stresses of an 82-game regular season and beyond. And, as the hockey world has become accustomed to, Ovechkin is an elite performer, armed with a well-earned reputation as one of the sport’s most accomplished and gifted offensive superstars. In 2014-15, he became the sixth NHL player to record six career 50-goal seasons and was honoured with his fifth finalist nomination for the Hart Memorial Trophy, an award he has won on three occasions. Could Ovechkin be in store for Ted Lindsay No. 4? Who are the big shots (on the teams still competing for hockey’s top team trophy) when it comes to taking the most shots in this year’s Stanley Cup Playoffs? Young Cash “Niebvechkin” got to meet his hockey hero after creating a video thanking him for gifting him with one of his sticks in Edmonton. Alex Ovechkin and Evander Kane are among the Players that took part in Kraft Hockeyville 2013 in Stirling-Rawdon and Belleville, ON.